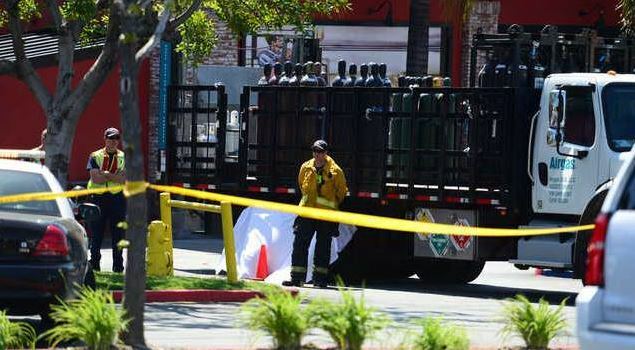 WEST COVINA >> An elderly West Covina woman died after being run over by a flatbed truck in a parking lot at the Eastland Center shopping mall Thursday afternoon, officials said. The fatal collision took place at 1:06 p.m. in the parking lot at the east end of the mall, 2753 E. Eastland Center Drive, in between a BJ’s Restaurant & Brewhouse and a Chili’s Grill & Bar, West Covina police Detective David Sifling said. West Covina firefighters were first on the scene of a reported collision between a vehicle and pedestrian, Sifling said. 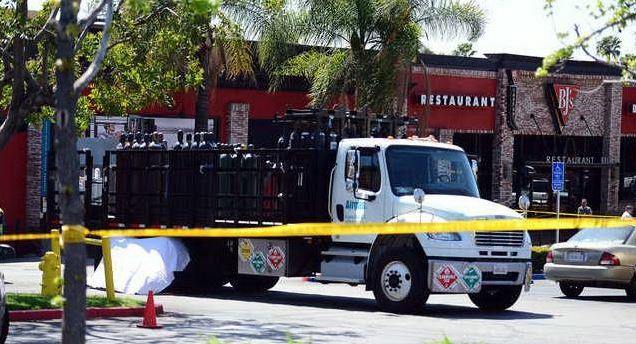 They found the woman pinned beneath the dual rear wheels of an Airgas flatbed truck hauling metallic gas cylinders, he said. It was immediately apparent the woman was beyond help, and paramedics pronounced her dead at the scene, the detective said. Her age was not available. The woman, described as a local resident in her 80s, was walking to the BJ’s with her adult daughter for lunch when she was struck by the backing truck, Sifling said. Coroner’s officials did not release her name Thursday pending positive identification and notification of kin. Sifling said the woman and her daughter were well-known at the BJ’s, and the neighboring Chili’s, where they dined often. Chili’s closed for business for the remainder of the day, officials said. Police interviewed the driver of the truck, who appeared distraught. A witness, who declined to be identified, said the truck was backing up, with its backing alarm sounding, when the woman was struck. An emotional family member at the scene did not wish to comment. No arrests had been made as officers from the West Covina police Traffic Division continued, Sifling said. Officers cordoned off a portion of the parking lot and escorted mall patrons to cars parked within the yellow police tape. Anyone with information can reach West Covina police at 626-939-8500. PASADENA >> A man attacked a teenage girl and robbed her at knifepoint at Memorial Park in Pasadena late Wednesday, authorities said. A 17-year-old Los Angeles girl was walking through the park, 85 E. Holly Street, about 6:05 p.m. when the robber grabbed her and pulled her into the men’s restroom, Pasadena police Lt. John Luna said. “The suspect threatened the victim at knifepoint,” he said. 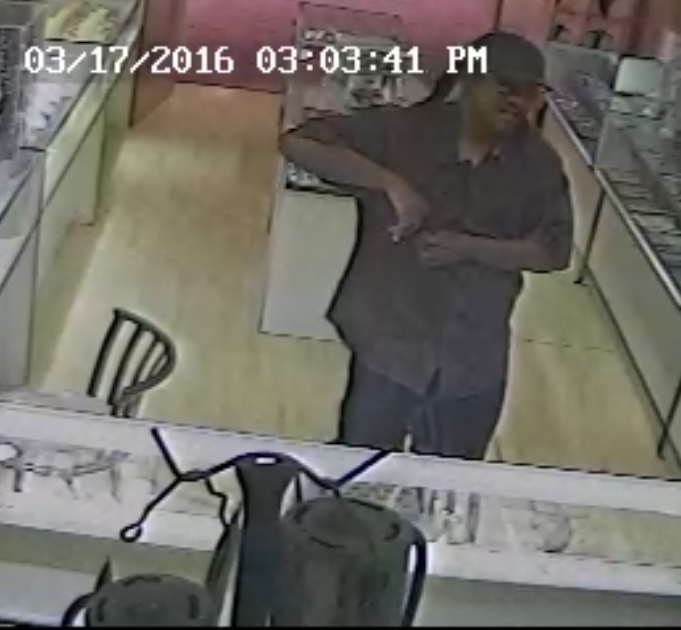 He obtained the young woman’s wallet, cash, gold chain and cell phone, the lieutenant said. After obtaining the items, the robber punched the victim in the stomach and fled north through the park toward Walnut Street, he said. Luna said the victim declined to be taken to a hospital. The robber was described as a black man in his 20s, about 5 feet 7 to 5 feet 8 inches tall, of thin build, wearing all dark-colored clothing. LOS ANGELES >> A San Dimas man who served as vice president of an Ontario tool wholesale company on Wednesday admitted to federal charges of defrauding a Pasadena-based bank out of more than $9 million, authorities said. Between 2007 and 2012, Yeung admitted to setting up a network of shell companies, controlled by himself, to give the false illusion that Easter Tools was conducting far more business than he really was, officials said. After using fraudulent documents to boost his business’ line of credit, “Eastern Tools defaulted on the promissory note after East West Bank discovered the fraud, causing more than $9 million in losses to the bank, Mrozek said. Yeung was arrested in connection with the investigation in April of 2015. Alleged co-conspirator and Eastern Tools and former Equipment President Guo Xiang “David” Fan, 53, is also named in the same indictment charging Yeung. He remains at large. MONTEBELLO >> A person died in a crash involving a big rig and a passenger car on the 60 Freeway in Montebello during rush-hour Wednesday afternoon, authorities said. The crash was first reported about 4:14 in the westbound lanes of the 60 Freeway near San Gabriel Boulevard, California Highway Patrol Officer Jennifer Bond said. Initial reports indicated it involved a jackknifed big rig and a sedan. One person died at the scene, she said. Officials shut down all but the right-hand lane of the westbound 60 Freeway as they cleared the wreckage and investigated the scene, along with the northbound San Gabriel Boulevard onramp to the westbound 60 Freeway. 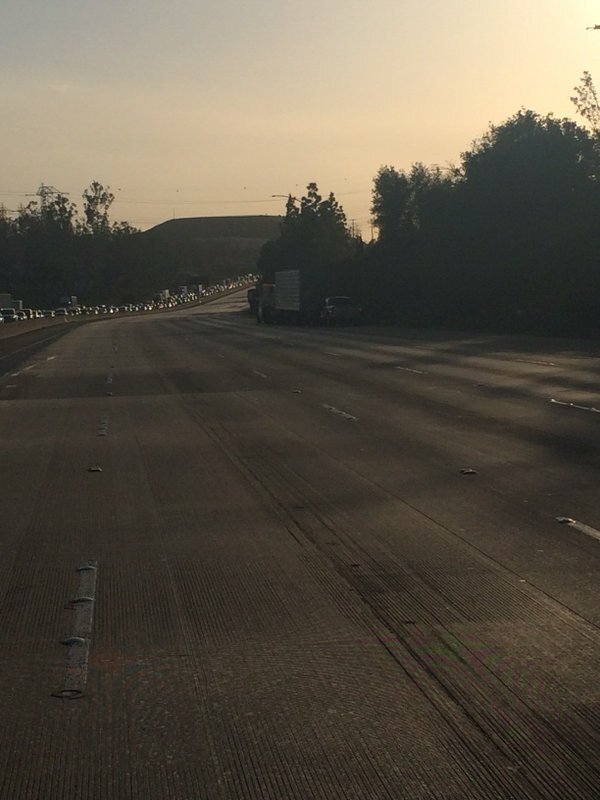 All traffic lanes were reopened about 8:30 p.m., according to the CHP. 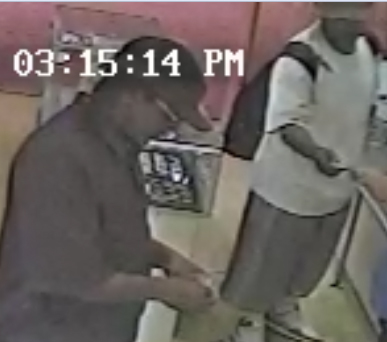 INDUSTRY >> Detectives are asking the public’s help in tracking down two men they say stole about $10,000 worth of gold rings from a Jewelry shop inside the Puente Hills Mall shop on St. Patrick’s Day earlier this month. 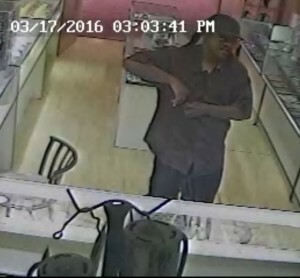 The crime took place about 4:15 p.m. on march 17 at C & L Jewelry Repair, inside the Puente Hills Mall at 1600 Azusa Avenue, Los Angeles County sheriff’s Detective Anthony Peraita said. One of the two suspect jimmied open the display case with some type of small tool, the detective said. The second suspect tried to keep the store owner distracted as the first suspect prepared to steal the 18 gold rings, some of which contained diamonds, which were valued at about $10,000. “Suspect No. 1 asked the owner of he could so some cleaning of his personal jewelry,” Peraita said. “And while (the owner was) doing so, the suspect proceeded to test the display case glass with a pry tool or a coin to see if it would lift up,” the detective said. Meanwhile, a second suspect entered the store and tried to distract the store owner as the first suspect continued working to pry open the jewelry display case, Peraita said. The accomplice eventually left the store, and the first suspect asks the owner to clean another piece of jewelry, Peraita said. “While the owner was in the back of the store, he actually lifted the display case and stole an allotment of jewelry from the store. He then proceeded to put the stolen goods down the front of his pants and exited the store, into the interior of the mall,” he said. Investigators described the first suspect as a black man between 25 and 30 years old, with black hair with two thick braids, wearing a black or brown button-up shirt and black or dark-colored jeans. His accomplice was also a black man between 35 and 40, wearing a white T-shirt, a tan hat, tan short and black backpack. Anyone with information can reach the sheriff’s Industry Station at 626-33-3322. Tips may also be submitted anonymously to L.A. Regional Crime Stoppers at 800-222-8477. *Surveillance video courtesy of the LASD. ROWLAND HEIGHTS >> A San Bernardino woman accused of abandoning a stolen car while high on drugs, allowing it to roll downhill and into opposing traffic in a bizarre Rowland Heights crash captured on a viral dashcam video, is now a fugitive after skipping out on her court date last month, officials said. Jasmin Lacey, 23, faces charges of driving under the influence of drugs, hit-and-run with a runaway car, auto theft, taking a car without the owner’s consent and driving without a valid license in connection with the Sept. 1 crash along Harbor Boulevard, between Vantage Point Drive and Pathfinder Road, Los Angeles County District Attorney’s Office spokeswoman Sarah Ardalani said. But Lacey failed to appear for a Feb. 10 arraignment hearing scheduled in the Los Angeles County Superior Court’s West Covina branch, she said. “A bench warrant was issued for her arrest,” Ardalani said. The strange series of events, which resulted in no injuries, was captured on another driver’s dashcam. The video, posted on YouTube, has since garnered more than 4.9 million views. In the video, the driver of a 2010 Hyundai Sonata — later identified as Lacey — suddenly slams on the car’s brakes, bring the car to a halt, and exits the vehicle. The driver then walks down the center median with a casual stride as the abandoned Hyundai rolls downhill and across opposing traffic lanes. California Highway Patrol officials said the car struck an SUV. A second SUV also became tangled in the wreck before the Hyundai ultimately struck two trees and came to a stop. After being found in the area, Lacey appeared extremely intoxicated and provided no explanation for her alleged actions, CHP Officer Armando Perdomo said at the time. She was initially arrested, but released from custody pending further investigation as officials awaited the results of blood tests, according to Perdomo and Los Angeles County booking records. Prosecutors filed charges Feb. 5, records show. The two auto theft-related crimes Lacey is charged with are felonies, Ardalani said. The three additional charges of hit-and-run, DUI and driving without a license are misdemeanors. SAN MARINO >> Police jailed a wanted Alhambra man and his girlfriend after the man fled from a stolen car, which contained drugs and a gun, in San Marino early Sunday, police said. The series of events began when police in San Marino pulled over a car in their city, according to Alhambra police officials, who assisted San Marino police. Officers detained the female suspect and discovered a gun and drugs inside the car, which had been reported stolen, officials said. It was also determined that the fleeing man had several outstanding warrants for his arrest. Police began keeping watch over the male suspect’s home in Alhambra, suspecting he may be trying to make his way there. An officer spotted the man walking down the street. The suspects identities were not available Sunday. San Marino police, who are handling the investigation, could not be reached for comment. EL MONTE >> Two teen suffered injuries when they tried to stop another teen, 14, from taking his mother’s car in El Monte early Sunday, police said. The incident unfolded about 2:15 a.m. when the 14-year-old boy got into his mother’s car at a home in the 2600 block of Lexington Avenue and began to drive away, El Monte police Sgt. Jimmie Pitts said. “His 15-year-old sister and 16-year-old friend attempted to stop him, because they believed he was intoxicated,” the sergeant said. The teenage girl and boy suffered “minor to moderate” injuries when they fell from the car, Pitts said. They were not run over. Paramedics took the injured teens to Los Angeles County-USC Medical Center for treatment, he said. Officers detained the 14-year-old driver and found no evidence he was intoxicated, Pitts said. He was not arrested as police continued their investigation. 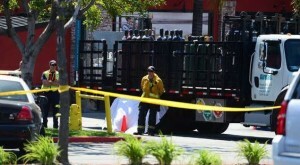 The Los Angeles County Department of Children and Family Services was also notified of the incident.